Disclaimer: One of us owns this and this is not a recommendation to buy or sell a stock. It’s just a fun read. Following the transaction the Company repaid all of its outstanding debt and was left with $5.5 million in cash, a large winery, and a huge pile of wine. 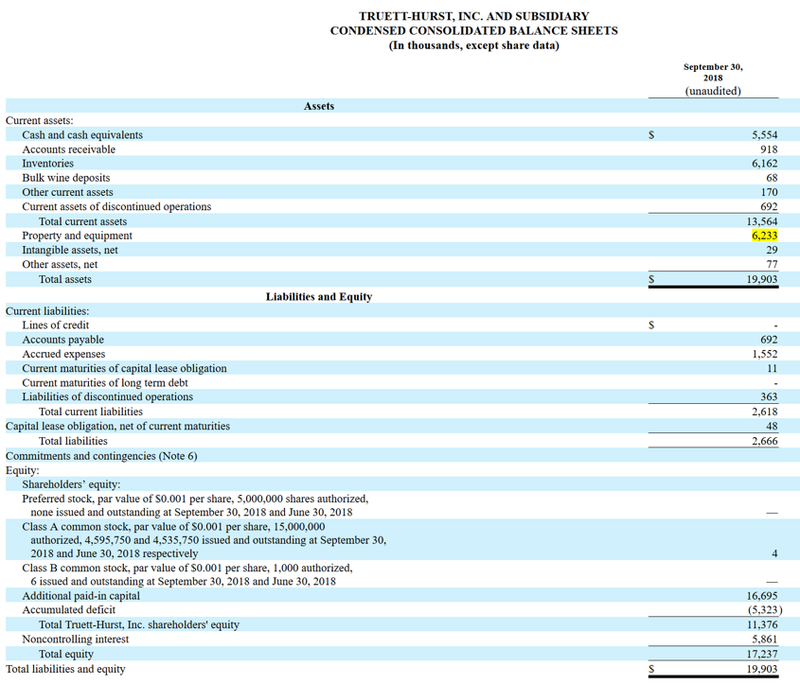 Here’s the latest balance sheet. Based on everything at book value, their book value per share is $2.30 (~$17.2M / ~$7.5M unrounded), compared to the current price of $2.10 (market cap of ~$9.6MM). However, their winery is carried at book value (and the offering also notes a potential lawsuit liability of $500,000; read the footnotes people). So we did a bit of digging. How much are California wineries anyway? We found one quite close to theirs for sale.. It’s listed at $5.25MM for 15 acres = $350K acre. Truett has 26 acres = $9.1MM. So based on napkin math their book value (with property and equipment valued at $6.2MM) is likely conservative, and this analysis also assumes no value for their brand, wholesale royalty arrangement (see offering fairness opinion projection assumptions), or the fact that there is an operating business in place. “We believe that the Company currently has fewer than 300 holders of record of the Shares, making it eligible to deregister the Shares with the SEC following a delisting of the Shares from the NASDAQ; however, we have a larger number of beneficial stockholders, which could result in eliminating our ability to do so or reinstituting our reporting obligations should all or a portion of those beneficial holders become holders of record. The Company expects that the Offer will reduce the number of the Company’s beneficial stockholders in an amount that the Company could more confidently pursue these alternatives, which may include delisting from the NASDAQ, trading on the over the counter (OTC) markets, deregistering our shares under the Securities Exchange Act of 1934, as amended (the “Exchange Act”), ceasing our public reporting and filings and/or taking steps to discontinue any further public trading of our stock…We could purchase 1,000,000 Shares if the Offer is fully subscribed, which would represent approximately 22% of our issued and outstanding Shares and 14% of our issued and outstanding Shares (including Shares issuable upon exchange of the LLC Units) as of January 7, 2019”. Given this exciting opportunity, there are two plays: Either 1) buy for short-term gain (stock is trading at $2.10, below offer of $2.40 for a 14% return if fully allocated) or 2) be part of company going forward and tell all your friends you part own a private winery. After the offering you’re going to be left with a clean debt-free winery with no wholesale noise and about 6.5 million shares outstanding. If you take the offering at face value, they say that their income last year from continuing operations (i.e. excluding the wholesale division) were ~$2 million. That plus listing savings of ~$500K gets you to about $2.5M. $2.5M/6.5M is about $0.38/share and at today’s price that is a P/E of 5.5x ($2.10 / $0.38). This also excludes the royalty stream and the cachet of being able to say “yeah, I co-own a private California winery”). However, it also includes a one-time insurance gain of $1.8MM last year.. Do your own analysis. (Note: The Offering also has a fairness opinion that includes projections through 2023 on page 136). The Company was kind enough to put together Pro Forma financials as well. The Offering also includes a fairness opinion with projections.